Green Mountain CBD's hemp farm in Hardwick. Since this photos the hemp plants seen here have more than doubled in size. More than 80 Vermonters registered with the Agency of Agriculture to grow industrial hemp in 2017, the third growing season since legalization in 2013. And while more than four times the number of people who signed up last year are growing in 2017, experienced growers have had a range of experiences. Green Mountain CBD has another five acres of hemp in the ground at its farm in Hardwick. The company has tripled its acreage this year by leasing land in Hyde Park belonging to High Mowing Seeds. And it's expanding its facilities in Hardwick. A new drying facility is going up because the one erected last year has been converted into a manufacturing center. There's $100,000 worth of stainless steel equipment inside including a 70-gallon double-boiler, refrigerators and a robot that shoots 20 milligrams of CBD oil into capsules. The compound CBD, or cannabidiol, is reputed to have medical value, including the reduction of inflammation and prevention of seizures in epileptics. CEO Alejandro Bergad explains the company's CBD oil consists of ground up hemp flowers, leaves and stems mixed with coconut oil. Hemp seeds are not used because of their low CBD content. "These are all just boxes of pills waiting to go through that counter over there, put into bottles," he says, before placing a plastic bottle that holds 90 capsules under a spout in the machine and dumping a box of pills into the counter. 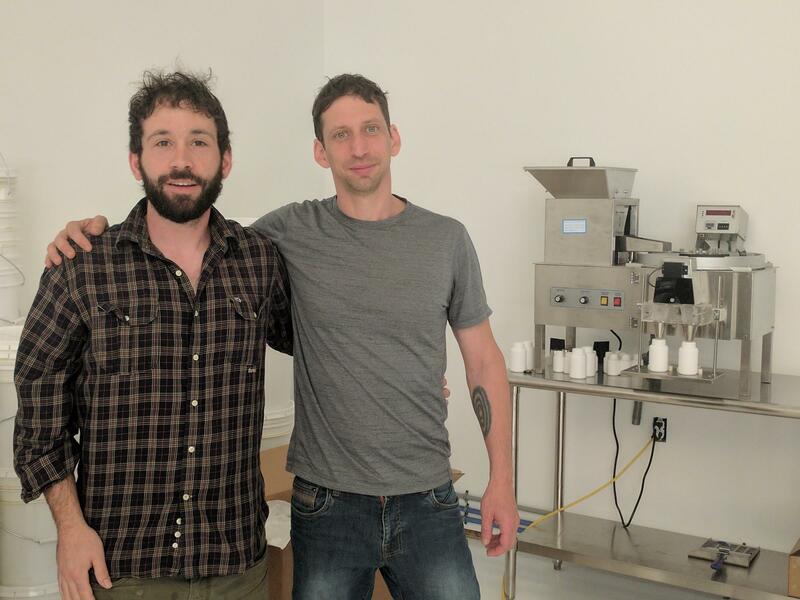 Jacob Goldstein, left, and Alejandro Bergad of Green Mountain CBD, in front of their pill counter. By producing and packaging its capsules in Hardwick, the company has created a few well-paying manufacturing jobs in Vermont. It plans to invest hundreds of thousands of dollars in new equipment in the coming months. The annual CBD market is expected to grow to more than $2 billion by the year 2020, though that projection includes CBD products made from marijuana as well as hemp. The Hardwick farm's CBD capsules sell for about a buck apiece, considerably less than the Colorado-based leaders of the CBD industry. "There's other farms that are growing it well," says Jacob Goldstein, the co-founder of Green Mountain CBD. “The challenge is to process it, market it, determine a brand for your products and get it out to the people." The process, Goldstein says, is "expensive, it's challenging and it takes a different skill set than just the agricultural side." Green Mountain CBD expects revenue of $2 million this year. Its capsules are currently in a hundred stores and pharmacies around the country but the majority of its sales are online. One of its customers is State Senator John S. Rogers of Glover, who has a dozen hemp plants of his own growing this year. He's hoping to produce enough seed for a more ambitious planting next year. While the number of people growing has increased in Vermont, not everyone has had an easy time growing hemp. John Williamson of State Line Farm in North Bennington specializes in seed oil crops. When Williamson grew hemp last year, people stole significant amounts, thinking it was marijuana, including three New York men arrested last fall with hemp in their car near his farm. The men are now facing felony grand larceny charges. Overall, hemp farming seems to be on the rise in in Vermont. University of Vermont's agronomist Heather Darby planted another acre of hemp this year at UVM's research farm in Allburgh. Darby says last year's inaugural hemp harvest was successful and that she learned a major lesson: Don't wait too long to harvest your hemp. The research farm's combine broke down after the harvest began and by the time it was back in commission, bringing in the remaining hemp was a challenge. The first annual Vermont Hemp Fest will take place at Burke Mountain on Sept. 9. Participants will include the Waterbury-based PhytoScience Institute, which does cannabis research and testing, and the UVM's Heather Darby. Manhattan-based radio journalist Jon Kalish has reported for NPR since 1980. Follow him on Twitter @kalishjon.